We have another Master Skinner spotlight, and this time I'm happy to have had the chance to speak with DaveBax! 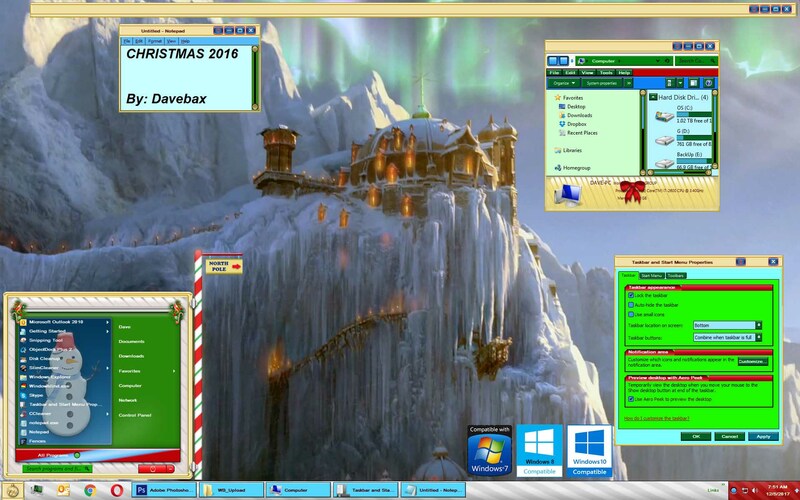 Dave has been a member of WinCustomize since around 2007, and he has made a variety of contribution to the site over the years. He is one of the top WindowBlinds skinners on the site, and was promoted to Master Skinner in 2016. We appreciate him taking the time to answer some of our questions for the community. Can you tell us a bit about yourself and how you got involved in “skinning” and WinCustomize? I have lived all my life in Southern New Jersey and was married for 44 years. I started working as an apprentice in welding when I was 19. Was in the industry for 46 years and worked my way up to a welding engineer. Retired July 2010 and never looked back. First got involved in skinning when I was looking for an email program. Found I wanted to try Incredimail somewhere around the year 2000. I liked it because it could be customized and began to make my own images. I built my own web sites to show case my graphics. 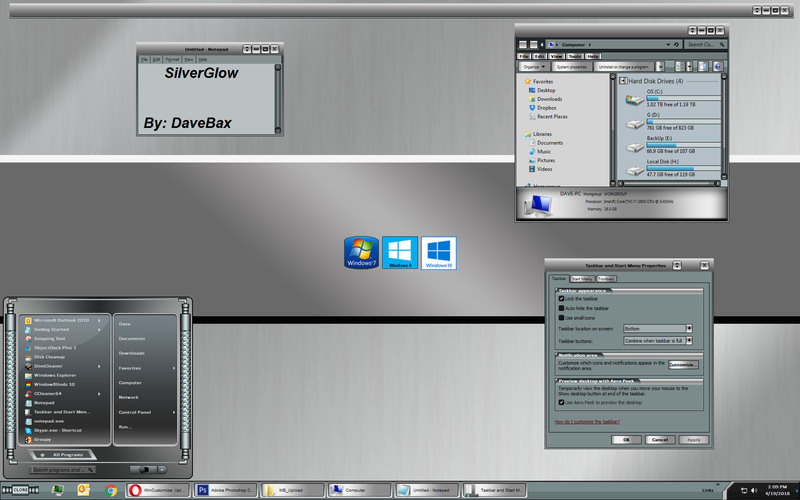 I was looking around and found Stardock in late 2004. Also the same time we found out my wife had cancer. So I had no time available but go to work and give all the support I could give. In 2007 while my wife was in the hospital after a major stroke I found Stardock again and at that minute joined. I had very limited time between working and taking care of my wife as she couldn’t talk or walk after the stroke. Managed to find a little time to make wallpaper or little things. I wanted to move up to docks and with all the help from (Steve)WebGizmos I became pretty good at it. Started making windowBlinds and the rest is history. You have a great variety of skins going back to 2008 including a ton of WindowBlinds skins. What do you like about creating skins for WB? They truly help me pass the time. Real enjoyment is seeing how many people like using them and enjoy reading the comments I receive. Without being able to share them I don’t think I would be making them anymore. As far as how long a skin may take I pay it no mind. They are all valued to me whether it’s simple or complex. None of this would be possible without the great people here and also the ones no longer here. I would ask a question and the answers would come. I help as many people here as I can now and enjoy it. How do you start the process for creating a skin? Do you have an idea of the overall design, or does that evolve during the actual design process? Sometimes I have an idea and sometimes it evolves. So many things one sees for ideas. TV commercial, driving in the car seeing a billboard design, looking at a car dashboard, etc. There are shapes of all types to see if one just looks. I make a full size Startmenu image template. Adding layers for top, bottom, sides, program and places list, design points, etc. as needed. Startmenu is first followed by the complete taskbar section. Now I have a very good visual and from there I mold the rest of the skin. Hardest thing for me is color. They have all been used so I try to use colors in different places. Again as I said before, I just enjoy it and the people here. Started with Paint Shop Pro and moved to Photoshop. Found it was useful having .psd files for sharing with ours. The majority of people here seemed to be using PS. There are some talented people here using PSP. My real opinion is whatever works best for the person using it is the best program to use. You do a lot of skinning. Do you have any other hobbies or interests besides skinning? Even with the cold weather here I walk often. Would say from April to November I walk with my dog 3 times a day for 4 to 5 miles total each day. The rest of the year I will walk depending on the weather. Just gave up bowling last year only because of the lack of leagues. I was 72 last time I bowled and retired with an average of 202 and really enjoyed it. Like skinning, bowling has taken a big hit and lacks a lot of interest by people now. I still golf each week and it can’t get any better than getting out there at 7AM with the birds, animals, and friends for true enjoyment. I still enjoy going to Atlantic City for some slot fun but only go about 3 or 4 times a year now. Been to Las Vegas 20 times and would love to make one more visit but finding someone to go with doesn’t seem to happen and I don’t want to go alone so doubt I will be back. Thanks for being a valuable member of WinCustomize and for taking the time to speak with us this week! You can see all of DaveBax's skins here. Keep your great windowblinds coming Dave! Great spotlight Dave, keep up the excellent work! Thank you for you contribution. You make great skins. Congrats Dave, for a wonderful spotlight, couldn't have happened to a nicer guy, also for your help in any questions I had. I feel very honored to be selected for this spotlight. Thank you to ID and Stardock for this selection. To all my friends here. Thank you all and without you I wouldn't be here. Great spotlight. Really enjoyed reading it. Congrats!! SuperDave strikes again!! Good job, Mr Bax. Keep it up, old guy!! well deserved spotlight Dave ! 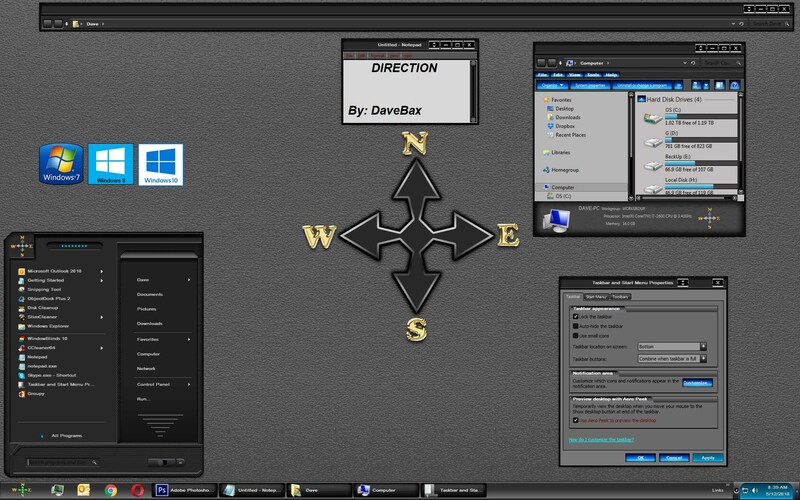 I remember you said that your wife desire was that you start to create WBs and I also told you that WB is really the front app of Stardock, any way we had really good times when you was making docks , long life to your creativity my friend !